This utility allows you to assign URLs to several different browsers so different websites can be opened with different browsers. This can be useful if you use some browser for everyday surfing but prefer another browser for particular websites. For example you use Opera for surfing, but you prefer to work with your GMail account using Google Chrome since Google services work much more faster and more stable with Google's native browser. MT Browser Switcher acts as system default browser. 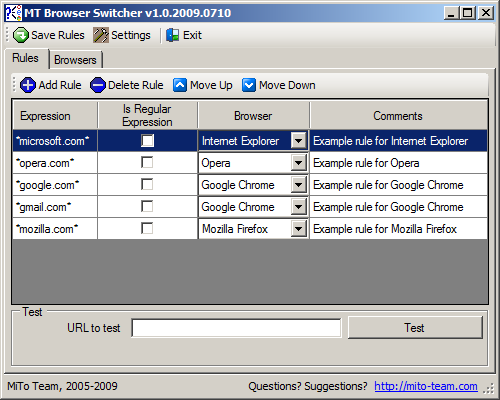 After you trying to open some URL (for example by clicking a link in text document or your favourite RSS-client) MT Browser Switcher analyses this URL and choses browser according to defined rules. If no suitable rule found for URL it opens it with default browser. * Download program and unpack it to any preffered path. * Start program and set it as system default browser (it will ask for this after first run). * Create custom rules or edit predefined example rules. Please feel free to report bugs or make a suggestions! A powerful multi-tabbed browser with recoverable Popup Blocker and Ads Filter. Qweas is providing links to MT Browser Switcher 1.1.20091123 as a courtesy, and makes no representations regarding MT Browser Switcher or any other applications or any information related thereto. Any questions, complaints or claims regarding this application MT Browser Switcher 1.1.20091123 must be directed to the appropriate software vendor. You may click the publisher link of MT Browser Switcher on the top of this page to get more details about the vendor.